With the new year comes fresh ideas. Perhaps you are tired of seeing that same color scheme in your living room and are hoping for a change in scenery. Maybe this will be the year that you finally tear out that wall and expand your bathroom’s borders. Since you’re considering renovations, why not take into account improvements that will make the value of your home soar? Here are a few upgrades that will do just that. There is a reason why the government offers so many tax breaks to homeowners who go the way of the sun. Solar power saves on electricity and makes your home that much more environmentally friendly. All of this translates to more money when you decide to sell because buyers love investments that require the least amount of money to maintain. Ever thought about knocking out a wall and creating a more open den? Go for it! Research shows that buyers love open space and seek homes that have fewer crooks and turns over those that require a road map to navigate. It costs about $3,000 to knock out a wall, but the return is at least double of what you pay. 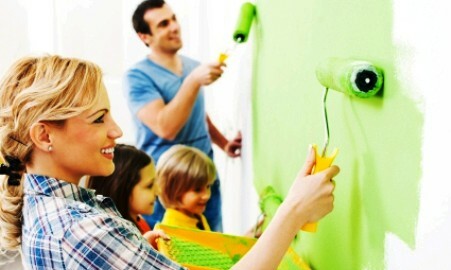 Changing the color scheme does more than serve as therapeutic treatment. Lighter colors make small rooms appear larger than life. Home values could rise upwards of $500 after interior paint has been applied to dingy walls. Not bad considering that painting can easily be a do-it-yourself project. When it comes to home value, every little thing counts. As such, lighting is a small addition that makes a big difference to buyers. Upgrading the porch light and fixture makes your home more appealing to the eye, which compels buyers to pay more. Adding a chandelier to the dining room adds sophistication that places your home in another category in terms of consumer interest. Speaking of going to the next level, a tankless water heater adds incredible value to your property. As with solar paneling, a tankless water heater signifies your willingness to be more efficient. Such installment has the potential to save thousands as water heaters without tanks are known to last several years longer than traditional systems. Perhaps you can only afford to renovate one room. Choose the bathroom. Research shows that property values soar when owners make quality improvements to the restroom. Spending thousands on a bathroom may seem like a lot at first, but a bathroom upgrade has the potential to place your home in another bracket when you decide to sell your property.